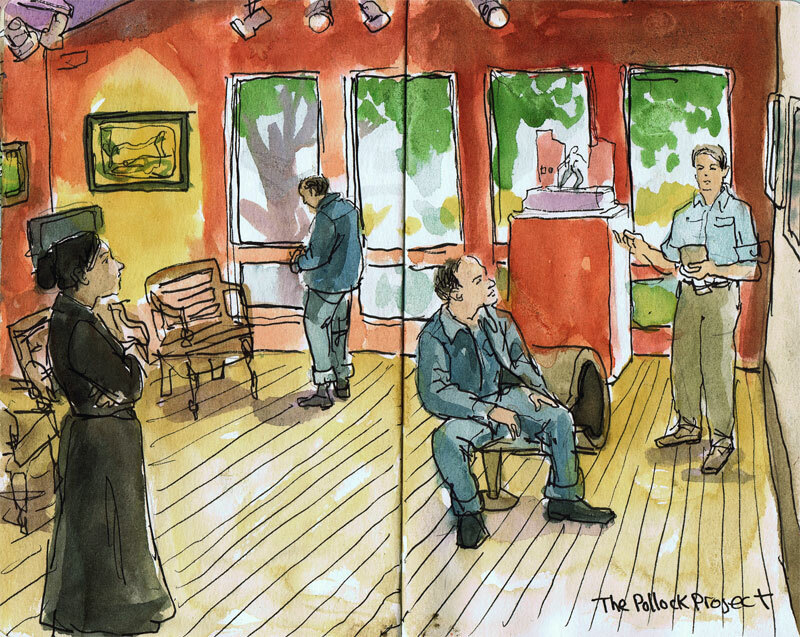 Spending so much time working on the Mennello Museum Mural, I realized I never posted a sketch I did of the Beth Marshal production of "The Pollock Project." This one act play was presented in the Mennello Museum gallery when Jackson Pollock's actual paintings were on display. John Didonna played Jackson Pollock and Jennifer Bonner played his wife. I just saw them perform together this week in a music video being produced for Britt Daley. Douglas McGeoch played the part of a German photographer who wanted to photograph Pollack at work and get an interview. John did an exceptional job playing the volatile and contentious artist. When the photographer questions Jackson's "style", the artist stormed out of the gallery shouting from another room in the museum. The audience who were seated in the museum gallery were right next to the performance. Jackson's wife managed to sooth his ego. The interview resulted in Jackson defending his work and vision, enlightening the audience in the process. Combining theater in the museum setting helped bring this artist's work to life in a new and exciting way. There was talk of bringing this type of production to other museums and I hope that idea takes flight. Hmm...combining theatre and museum...sounds very promising! Thank you for your interesting posts and lovely sketches.